Teulada also has easy access to Denia, Javea, Benissa, Calpe, Gata de Gorgos, La Sella, La Xara, the Jalon Valley, Lliber and Benidorm. Teulada is an easy drive from three international airports of Alicante, Valencia and Murcia. You can get driving directions to Teulada from Alicante airport by using our Teulada map. If you not interested in hiring a car you can arrange a airport transfer to Teulada. Transfer options include private shuttle buses, taxis or Teulada car hire. Teulada is known for its many furniture shops (meubles) with a great high street with many lamp and furniture shops as well as wine shops and jardinerias (garden centres). Teulada has a Mediterranean climate enjoying over 300 days of sunshine a year, long hot summers, mild winters with very little rainfall. Teulada does not have any beaches because it is set inland off the coast but if you are using Teulada as a base for your vacation or holiday then the beach resort of Moraira is just 4km away with very good beaches, especially at El Portet or the main beach of L’Ampolla. 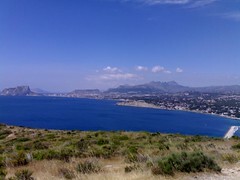 Nearby towns of Javea and Calpe also have good beaches and facilities. The town council of Teulada has passed laws in the past to limit the height of tall buildings unlike the skylines of Benidorm and Calpe, to protect the pine trees covering the valleys all the way to Moraira. Agriculture is still of great importance to Teulada as the terraced slopes are dominated by olives, almonds, grapes, lemons and oranges but nowadays tourism and construction form the backbone of the local economy. This page contains useful Teulada information for people intending to visit or holiday in Teulada. In this tourist guide to Teulada we help visitors who are planning a trip with useful and practical advice on many tourism related subjects such as Teulada car hire, Teulada accommodation, sightseeing, weather, where to go, where to stay, travel information, excursions and what to see and do in and around Teulada. We also have photos, picture galleries, views, videos and Teulada webcams so you can see what Teulada has to offer you for your Teulada holiday. The market in Teulada is every Wednesday morning where you can buy your fruits and vegetables, handbags, honey, local crafts and souvenirs to take back home. Teulada is so well situated that the nearest beaches of Moraira, Javea, Benissa, Calpe and Denia are less than ten minutes by car. Benidorm with its buzzing nightlife, shopping and theme parks are only twenty minutes away by car. There are theme parks to visit such as Aqualandia which is a water park, Mundomar is Spain’s answer to Sea-World, Terra Mitica theme park is an amusement theme park with rides based on the ancient world and Terra Natura-Aqua Natura is a zoo with many exotic animals from around the globe and it has its own water-park called Aqua Natura. The local tourist office offers a service where they can help you find accommodation in Teulada. There are Teulada hotels, pensions, apart-hotels and hostels. There are lots of Teulada rentals with plenty of Teulada apartments for rent and Teulada villas for rent. We also have help and information to those people who are looking for Teulada property or Teulada properties. There are lots of properties for sale in Teulada mostly apartments and some villas on the outskirts of the town and because Teulada is off the coast prices will be a lot lower than in nearby Moraira. Whether you’re looking for a place to rent or to stay at permanently, you can take advantage of the services from the real estate agents in Teulada who are more than willing to help you in finding your ideal residence. You can contact Teulamar Construccions (www.teulamar.com, Tel. +34 965 740 168) and Residenza Real Estate Group (www.residenza-realestate.com, Tel. +34 665 083 805 and +34 605 759 068). The tourist centre office in Teulada can help you will local information such as maps, guides, brochures, help with accommodation and they can answer any questions you have about dates for festivals, fiestas, weather information, transport and airport transfers to Teulada. Some of the more local fiestas are San Vincente Ferrer which is held every Monday after Easter to celebrate the Patron Saint. The fiesta of the Moros y Critianos (Moors and Christians is held during the second week in June. The Festa del Moscatell is held on the first Saturday in September and the fiesta of Santa Catalina is held on the 25th November. Below is a video showing some of Teulada’s interesting places and infrastructures. Teulada Page Summary – This page contains unique content about the small town of Teulada, near the towns of Benissa and Moraira on the Northern Costa Blanca. Please help us to make this the number one tourist resource for Teulada by adding any comments, reviews, ratings and feedback on any aspect of Teulada that you know about. We also welcome your photos, pictures and videos of Teulada for posting on our website. Thanks for the tourist office address and email!